Have a whale of a time in the bath with this cute and friendly bathtime bubbles whale from Vtech. Bringing bathtime to life this welcoming companion blows bubbles in time to different music and sounds, a fun, interactive and exciting twist keeping a smile on your little ones face as they splash along. Cute bathtime whale friend that blows out bubbles. Switch for turning the bubbles on and off. Fully waterproof; Size H27.9, W30, D10cm; Batteries required: 3 x AA (included); For ages 1 year and over. WARNING(S): Only for domestic use; To be used under the direct supervision of an adult. Only to be used in water where the child is within its depth and under adult supervision. This toy does not provide protection. Make a splash with the VTech Bathtime Bubbles Whale. This cute sea creature blows out bubbles and plays happy music. It also features five colourful buttons that introduce animals, colours and instruments – you’ll have a whale of a time! Stick it to the wall with the two suction cups and press the button to turn the bubbles on or off. The VTech Bathtime Bubbles Whale needs 4 x AA batteries included and makes a great bath time friend for kids aged 12 months and up.Have a whale of a time in the bath with the Bathtime Bubbles Whale from VTech! 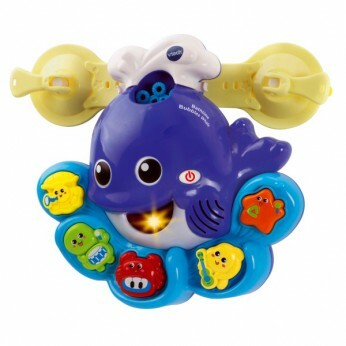 This cute bathtime companion features bubble blowing technology that releases bubbles in time with the music and sounds.There are 5 big bright buttons that introduce the happy animal friends, along with their instruments, different colours and an assortment of jolly tunes, fun sounds and great sing-along songs!It also features two strong suction cups that allow the whale to be attached to the bathroom wall. The whale is also fully waterproof and has a switch for turning the bubbles on or off. This toy costs approximately £19.99 (for the latest and best prices make sure you check our retailer list for the VTech Bathtime Bubbles Whale above). In our review of VTech Bathtime Bubbles Whale we classed it as being suitable for ages 1 to 3 years but recommend you check the manufacturer specific advice before purchasing.